Your kitchen deserves to be furnished with the best products, which is why we only stock quality brands at incredibly low prices. We make being fashionable affordable by slashing the prices on top brand double stainless steel sinks from Astracast, Bretton Park, Rangemaster, and Smeg. We provide an exceptional range of sinks in a variety of shapes and sizes. The Astracast Onyx double bowl stainless steel sinks are noticeably modern in their design and would suit a kitchen with a contemporary style. Find the perfect new sink for you kitchen among the HC Supplies stainless steel collection. It is incredibly convenient to be able to purchase stainless steel double sinks that are already accompanied by draining boards, and you will discover many beautiful models in our sales. The Astracast Korona double stainless steel sinks are a popular choice among our customers. This could be due to their combined style and practical nature, as they are easy to clean and rust resistant. Other options to consider are the Smeg Alba double bowl stainless steel sinks, which at less than half price are certain to be snapped up in no time at all. All our designs can be found at considerably less than the recommended retail price and if you are searching for designer double stainless steel sinks, you will discover all you need right here, at the HC Supplies online store. Peruse our high end selection and delight in the stunning design of the Smeg Mira double stainless steel sinks. If you are on a strict budget, take a look at the Smeg Alba double sinks stainless steel bowls, which currently have 40% off their retail price. Find more amazing designs among the 2 bowl stainless steel sinks collection. Come In Store To Find Out More! 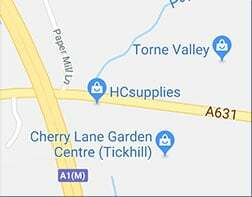 We are not just an online store, and if you want to view our products in person, we invite you to do so at our showroom in Doncaster. Full details about where to find us can be found in the About Us section of this site. If you require any further information about our products, or our showroom, give our friendly team a call.